Larry Ellison doesn't do "cheap." The Oracle chairman isn't interested in selling the low-cost one- and two-socket servers that make up a huge slice of the server market but yield little profit for the companies that make them. Even if he did, that business is pretty much sewn up by Hewlett Packard Enterprise, Dell, and the "white box" makers from China and Taiwan. But Ellison's also a realist, and he knows customers are gradually turning away from his pricey Unix systems in favor of x86 boxes to build scale-out private and hybrid clouds. So to keep customers interested in Sparc, Ellison needs to come downmarket and provide more affordable options. That's the thinking behind a new Sparc processor Oracle launched Wednesday, along with a new family of servers that hit lower price points than Oracle has offered in the past. They're not the cheapest of the cheap -- prices start at around US$11,000 -- but core for core, Oracle maintains they're on par with x86 for cost. 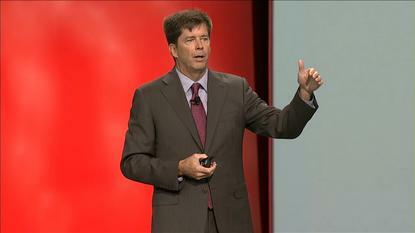 "This gets us into commodity priced platforms," said John Fowler, the executive in charge of Oracle's systems business. Kevin Krewell, an industry analyst at Tirias Research, sees the new systems as a defensive move to stem the flow of customers away from Sparc and Oracle's Solaris OS. "They're trying to hold on to existing customers," he said. That's important for Oracle. Its hardware business generated $4.7 billion in revenue last fiscal year, down 32 percent from 2011, the first full year after Oracle bought Sun. That figure includes money from hardware support services; revenue from hardware alone plunged 44 percent over the same five-year period. Part of that was by design. Oracle stopped selling many of Sun's lower-end products and focused on "engineered" systems -- high-performance products that yield bigger profits and help sell more of Oracle's database and applications software. But developing new microprocessors is a costly business, and ultimately, Oracle needs to maintain a sizable hardware business to make continued investments in Sparc worthwhile. The new processor is called the S7, a less powerful version of Oracle's high-end M7 chip launched in October. Oracle sketched out plans for the chip last year under the code name Sonoma, and it launched the first products on Wednesday at OpenWorld in Brazil. The S7 is based on the same fourth-generation Sparc core as the M7, and it's manufactured on the same 20-nanometer process. But there are eight cores per chip on the S7, compared with 32 on the M7. Like the M7, the new chip has "software in silicon" features for accelerating database and security functions. But it also integrates memory and I/O interfaces that for the M7 are separate on the motherboard, helping to keep costs down. There's just one version offered, at 4.27GHz. Oracle announced two standalone servers with the new chip, the S7-2 and S7-2L, as well as an engineered system, the MiniCluster S7-2, which is a smaller version of the Oracle SuperCluster. The S7-2 is a 1 rack-unit server, designed for maximum density, sold with one or two processors. The S72L is a 2 rack-unit system, with two processors, that handles more storage configurations. Both can use a mix of SAS and NVMe storage. The servers start just north of $11,000 with a single processor, 64GB of memory and two 600GB disk drives, and run to about $50,000 with two processors and a terabyte of memory. While Oracle's bigger Sparc systems run traditional ERP and CRM type applications, Fowler hopes the S7 servers will attract more modern Java, Hadoop and Spark workloads. Oracle also launched a new Sparc-based infrastructure-as-a-service offering on Wednesday, which customers can use to back up the new systems. Oracle didn't provide pricing for the MiniCluster, but it is supposed to broaden the market for Oracle's engineered systems, which combine compute, storage and networking in a preconfigured box with virtualization and management software. Ellison has said he wants to compete better on price with EMC and Cisco in converged systems, and MiniCluster looks designed to do that. A big difference from the SuperCluster is that much of the setup and administration is automated, so customers can get the security and high-availability features of the larger machine without needing as much Solaris expertise, according to Fowler. "You don't have to be a Solaris jockey to use this thing," he said. One oddity is that Oracle has said the S7 chip includes an on-chip InfiniBand controller, for high-speed clustering. But none of the new systems make use of that capability. They opt for Ethernet instead. "In line with the design goal of simplicity for MiniCluster, we decided to stay simple by using SAS for storage and Ethernet for network connectivity," Oracle said in a statement. As for the standalone servers, use of InfiniBand in "DIY solutions" has been limited, Oracle said, and qualification of the various InfiniBand interfaces on the market is "very resource intensive." Customers can use an add-in card for InfiniBand if they want to. That seems like a curious situation, but it's all we could get from Oracle for now. Nathan Brookwood, industry analyst at Insight 64, said the S7 servers could appeal to customers who don't need the power of an M7 system but are wary of porting applications to x86. "The challenge for Oracle," he said, "is can they expand their customer base."